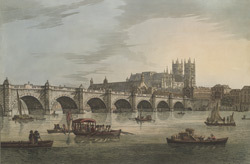 View of Westminster Bridge showing Westminster Hall and Abbey at the other end. For centuries there was no bridge at Westminster, and by the 18th century traffic had to use a waterman, the horse ferry, or go around to London Bridge or Putney Bridge. However this proved increasingly inadequate as Westminster had grown so much. In 1721 a project was started and well known architects were invited to design a bridge. Eventually a Swiss man, Charles Labelye, was chosen as engineer. The bridge was started in 1738 and opened in 1750 with a grand procession.